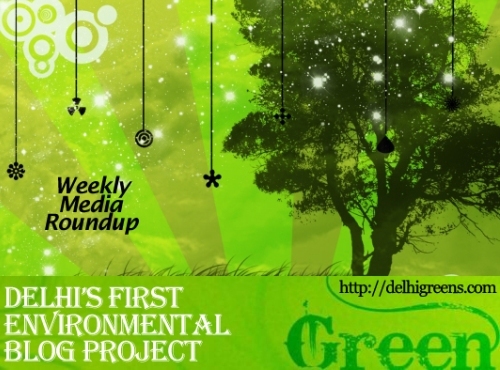 Weekly green news roundup from across different media networks for week 44 (between Oct 26 to Nov 1) 2015. A new study on air pollution in Delhi by a team of researchers led by the University of Surrey in the United Kingdom has found the city suffers from a “toxic blend of geography, growth, poor energy sources and unfavourable weather that boosts its dangerously high levels of air pollution”. Trucks entering Delhi from neighbouring states will have to pay Rs700-Rs1,300 each as pollution tax from November 1 as the Supreme Court today rejected a plea for postponing its introduction by a month. The National Green Tribunal today left it to the Delhi High Court to resolve the deadlock between the AAP government and civic bodies on the issue of garbage dumping on the streets of the city due to the ongoing sanitation workers strike. The Delhi government today decided to get the capital’s first-ever tree census done by a “third party”, essentially an NGO, to arrive at a factual figure of the number of trees in the city. Two days after the National Green Tribunal and the Delhi high court took serious note of the sanitation crisis in the city, the East Corporation on Friday began its work to clear the mess. Delhi Metro Rail Corporation , which is adding 135.1 km to its existing network under phase-III, is planning a construction and demolition waste recycling plant. The Delhi government is all set to take some lessons from Stockholm city. A multi-department committee set up to examine ways of using recycled construction and demolition waste products has recommended that all future government constructions work use at least 2-5% C&D waste products as part of building material. With the Yamuna at risk of encroachments despite several court orders, environmentalists now fear that the last green patch of the flood plain on the west bank of the river may be subject to illegal use. The National Green Tribunal has pulled up Public Works Department for chopping 40 trees for widening of a road at Rao Tula Ram Marg here and summoned its senior officials warning them that they may have to pay for transplantation of remaining trees. A team of students from IP University, led by a professor from the university’s School of Environmental Management have discovered a new species of spider in Delhi’s Asola Bhatti Wildlife Sanctuary. Proof that winter has arrived lies not just in the nippy mornings but in the sights and sounds of a variety of migratory birds that flock to the NCR every year. Are some residents of Delhi and Gurgaon drinking toxic water? Industrialists of the city have written to Prime Minister Narendra Modi against the Delhi government’s directive of levying pollution entry tax of Rs 700 per entry on commercial vehicles carrying industrial goods via Delhi come Nov 1. The ozone hole over Antarctica expanded this month to one of the largest sizes on record due to unusually cold temperatures in the stratosphere, which could lead to more harmful ultraviolet rays reaching the Earth, according to NASA.